Desperate for getting your pre-baby body back, you rush back into your old exercise habits as soon as the doctor gives you the green light to start physical activity. You feel energetic and motivated enough to go back to your yoga classes, AND your boot camp, AND why not! Your running group. Until one day, suddenly something feels different. Pelvic organ prolapse is often known as POP, very well explaining the feeling that many women experience as if something had popped out of their vaginas. A pelvic organ prolapse occurs when any of the walls supporting your pelvic organs slips down into the vaginal canal. The prevalence of this disorder is extremely high, it is estimated to affect to a 50% of women after childbirth. If you are brave enough to talk about it, you will be very surprised how many women around you have this problem, if not yourself! The prevalence of Pelvic Organ Prolapse is 50% of women after childbirth. If you are brave enough to talk about it, you will be very surprised how many women around you have this problem, if not yourself! Childbirth complications such as large weight babies, use of forceps or suction, long 2nd stage labor, episiotomies or multiple childbirths. Hormonal changes during menopause that affect to strength and elasticity components of the supportive structures of the pelvic organs (muscles, ligaments and connective tissue). Heavy lifting: lifting children or heavy weights, also weights training. Genetics: a history of POP within the family increases the likelihood of suffering this disorder. Every woman before, during and after childbirth should be well educated about POP. The more knowledge we have about our bodies, the better we can act to prevent or decrease the risk of prolapse. Pelvic organ prolapse is not something a woman just needs to live with it, and, unfortunately, gravity works against this condition, and if nothing is done, it will only get worse. Visiting your gynecologist or a therapist specialised in women’s health is a wise decision to look for symptoms and start taking action. 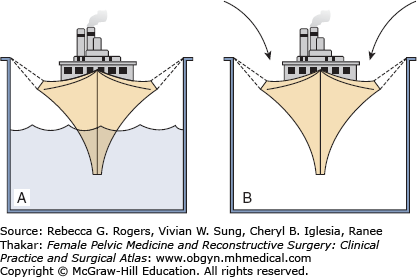 Norton (1993) describes the pelvic floor supportive system with what he calls “the boat in dry dock” theory, where the ship represents the pelvic organs, the ropes are the ligaments and the fasciae, and the water all the pelvic floor muscles. If we reduce the amount of water to the dock, it will tighten the ropes to hold the ship in place, if this situation is maintained for a long period, the ropes will eventually get damaged. Your pelvic organs respond in the same way when your pelvic floor muscles fail to provide enough support. Over time, the connective tissue and ligaments that were supposed to assist in this function and now they are doing all the work, become stretched and damaged. This theory explains the relevance of maintaining a good pelvic floor tone that provides constant support and continence to the pelvic organs. 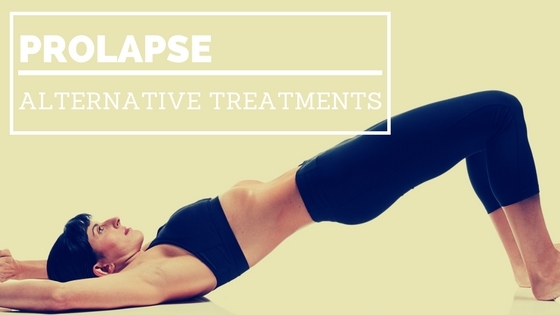 Some of the most non-surgical treatments for Pelvic organ prolapse vary from pelvic floor retraining, behaviour and diet modifications, weight loss or pessaries (a removable device that comes ins different shapes that support the herniated structures). However, at Core Tone fitness we think that the pelvic organ support has a large postural component. The way you stand, you move or even breathe has a reflect on your pelvic floor, and to prevent or restore its disorders it is essential to take a holistic approach to the body, understanding how the different structures work in synergy. Women diagnosed with a POP should avoid any physical activity that increases IAP. Doing crunch-based core exercises or even planks, heavy weight lifting or high impact activities will only worsen your condition. Lifting your baby is unavoidable, but learning to do it safely with correct breathing and alignment will considerably reduce the pressure on your pelvic floor. Activates the muscles fibers of the pelvic floor responsible for maintaining the adequate tone and support. Corrects your breathing patterns, so your pelvic floor works in perfect synergy with your abdominal wall and diaphragm at any moment of your life. Improves your overall posture: a slouched position will put pressure on your abdominal cavity and therefore on your pelvic floor. Decongests the pelvic area: the abdominal vacuum produced during the hypopressive practice provokes an upwards movement of your internal viscera helping its repositioning. Improves blood circulation within your abdominal cavity, which means better blood supply to your organs and tissues, which will receive more oxygen and nutrients to enhance regeneration. What is the de difference between Hypopressive techniques – Low Pressure Fitness and Kegel exercises? The most significant difference between these methods is that while Kegel exercises are focused on strengthening the pelvic floor muscles and train your capacity to contract them, Hypopressive exercises develop the muscle tone, which is the degree of muscle tension when your pelvic floor muscles are at rest. Maintaining a good muscle tone is essential for continence. During a Kegel exercise, the pelvic floor moves upwards due to a voluntary contraction of the muscles. On the other side, during a hypopressive exercise, the pelvic structures move due to a plunger effect provoked by the diaphragm. There is no voluntary muscle contraction. Kegel exercises are based on isolated pelvic floor contractions, whereas hypopressive techniques exercise your core as a whole and considering other aspects such as posture and breathing. TAKE YOU PROLAPSE AS SERIOUS AS IF YOU HAD A DISK HERNIA! If that were the case, you would probably go regularly to a therapist to manage the pain, strengthen your body to protect your back and improve your posture. You would also avoid lifting heavy weights or any activity that would flare up the condition. A prolapse needs the same level of care if not more. If you commit to an appropriate training program, you will quickly start noticing positive changes in your body and your quality of life will improve in many aspects.